The Isle of Mull lies off the west coast of Scotland and is the second largest island of the Inner Hebrides. The island has a population of 2800 people, the majority living close to Mull’s main village, Tobermory. The abundant species of wildlife and diversity of habitats found on Mull have given the island its reputation as one of the best places in the UK to watch wildlife. Many visitors return year after year to watch eagles, otters, red deer, seals, porpoises, dolphins, whales and sharks. 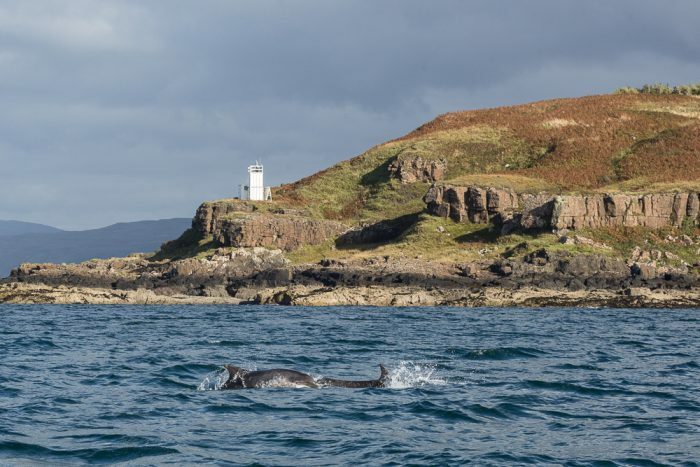 Many species can be watched from land, but it’s also a wonderful place to explore by boat and there are a number of trips on offer, both in search of marine species and to explore the neighbouring islands of Iona, Ulva, Treshnish and the Small Isles. Mull’s three hundred miles of dramatic coastline provide excellent walking, fishing, and cycling and a chance to explore stunning white sand beaches, black basalt beaches and rocky coastline. The island is only 45 minutes by ferry from the picturesque fishing town of Oban on the mainland, while two other ferry routes serve those travelling from more remote ports the west and the north. Exploring Mull on foot, or by bus or car is magical and when you’ve earned a rest, you can relax in one of the many fantastic places to eat found all around the island. Mull has some fantastic places to eat and drink. The Mull & Iona Food Trail showcases delicious island produce available on Mull, Iona and neighbouring islands, Ulva, Gometra and Erraid; to encourage visitors and residents to enjoy food that is grown, caught and produced here.